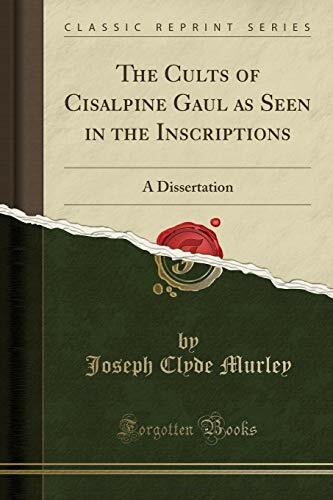 Excerpt from The Cults of Cisalpine Gaul as Seen in the Inscriptions: A Dissertation<br /><br />Somewhat greater latitude of discussion has been allowed in the case of some cults which are, wholly or in the main, restricted to Cisalpine Gaul; where the evidence for this region seems merely to square with the evidence elsewhere the treatment has been more sum mary and statistical. Certain generalizations which might have been offered in an introduction have been included, for convenience, in the chapter on Dediccmts and their Social Groups. Part of the conclusions there set down may be summarized in these statements: that the largest number of dedications are inscribed to the Roman gods; that the numbers range downward in order as given through Greek, Celtic and Italic (of equal prominence), and Oriental gods to deified abstractions, syncretistic conceptions, and Divi; that women make a larger proportion of their offerings to the Italic gods (among which are included several important female deities) than do men, and Roman gods are in especially high favor with slaves; and that Jupiter, Mercury, Hercules, the Matrons, Silvanus, Minerva, and Mithras are, in descending order, the gods most often worshipped.<br /><br />About the Publisher<br /><br />Forgotten Books publishes hundreds of thousands of rare and classic books. Find more at www.forgottenbooks.com<br /><br />This book is a reproduction of an important historical work. Forgotten Books uses state-of-the-art technology to digitally reconstruct the work, preserving the original format whilst repairing imperfections present in the aged copy. In rare cases, an imperfection in the original, such as a blemish or missing page, may be replicated in our edition. We do, however, repair the vast majority of imperfections successfully; any imperfections that remain are intentionally left to preserve the state of such historical works.